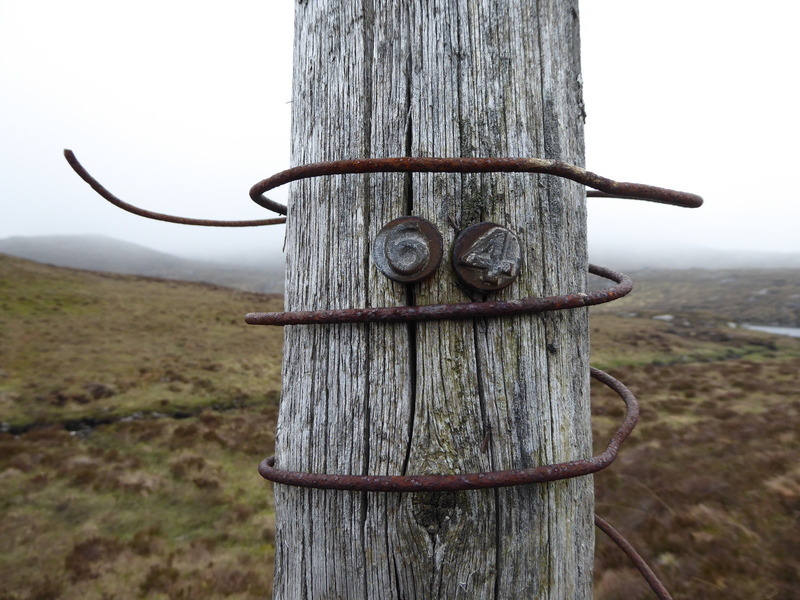 On a recent hillwalk in the remote hills to the south of Scatwell/Strathconon, we came across a line of derelict telephone poles. The poles “marched” (with various atitudes!) 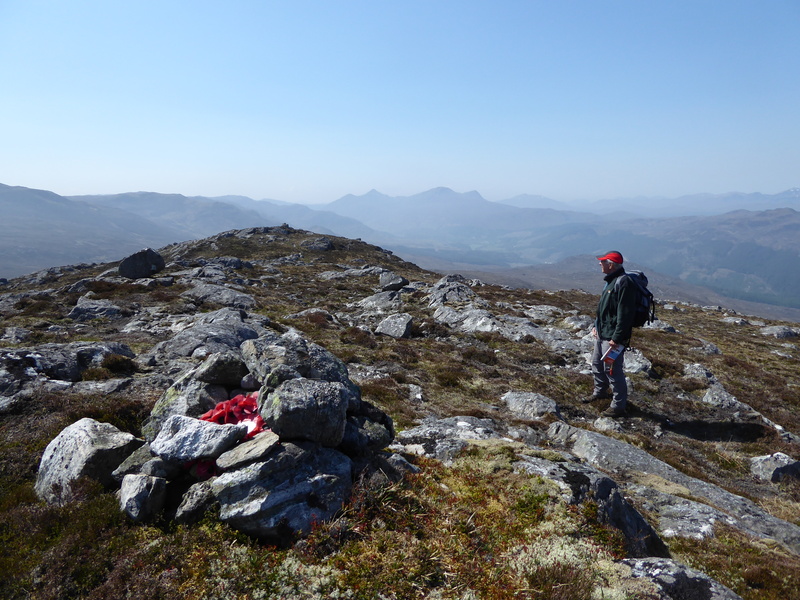 over the hill towards Loch Orrin; an unusual feature at an altitude of between 330m and 430m – why were they there? what was their purpose? and when? We were keen to find out. 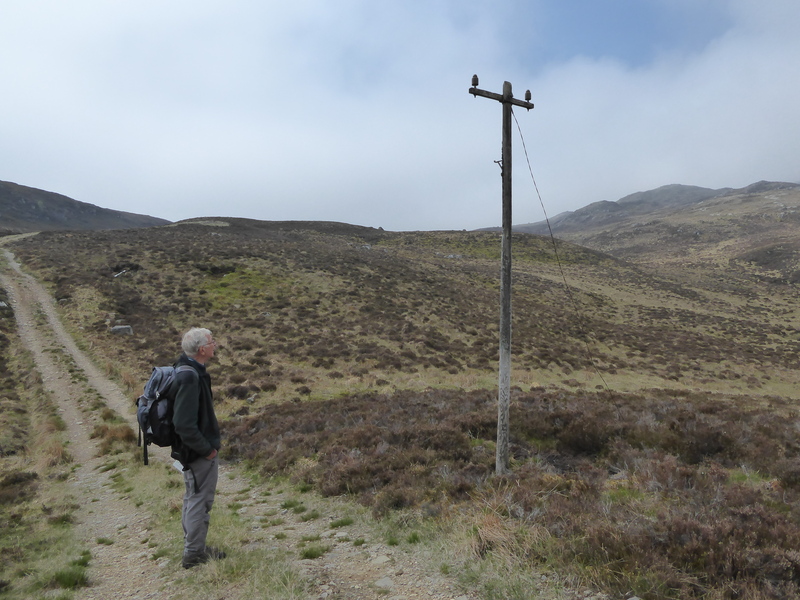 Lines of telephone poles are, or were at one time, a bit of a blight on the landscape but now we see fewer of them and they are rapidly becoming a “thing of the past” as more phone lines are buried underground. One could argue that they are not of archaeological importance, but they are certainly part of our history. We decided to record these poles and investigate. 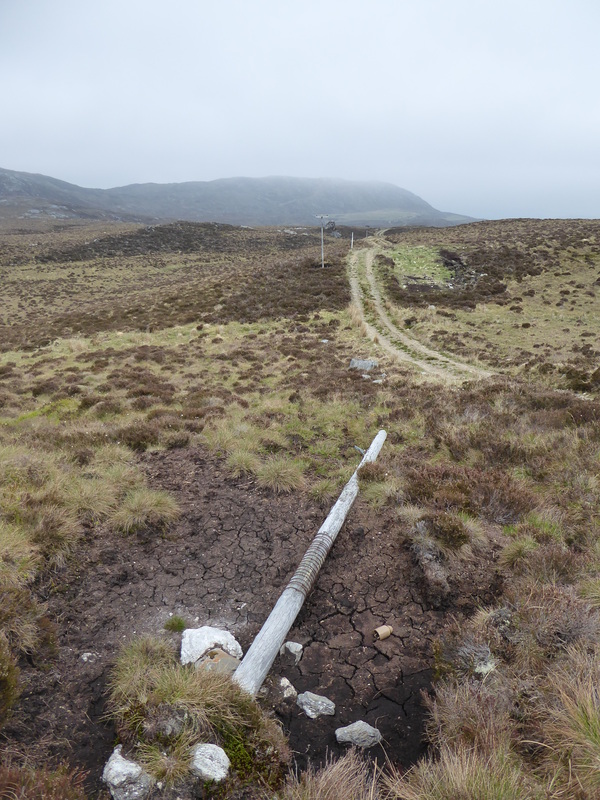 The poles are located 4kms south of Scatwell House and stretch for c1.5kms from Loch an Fheoir (NE end GR – NH 3939 5326) to Loch Aradaidh (SW end – NH 3862 5255), following the line of the well-made estate track from Scatwell over to Glen Orrin. Ten disused poles in various states of preservation were seen, most were upright but some had fallen and others were at jaunty angles. The poles are of timber and generally 12cms in diameter and up to 5m in height; many had wire stays. Most had a single step-iron near the top and metal discs with identification numerals. 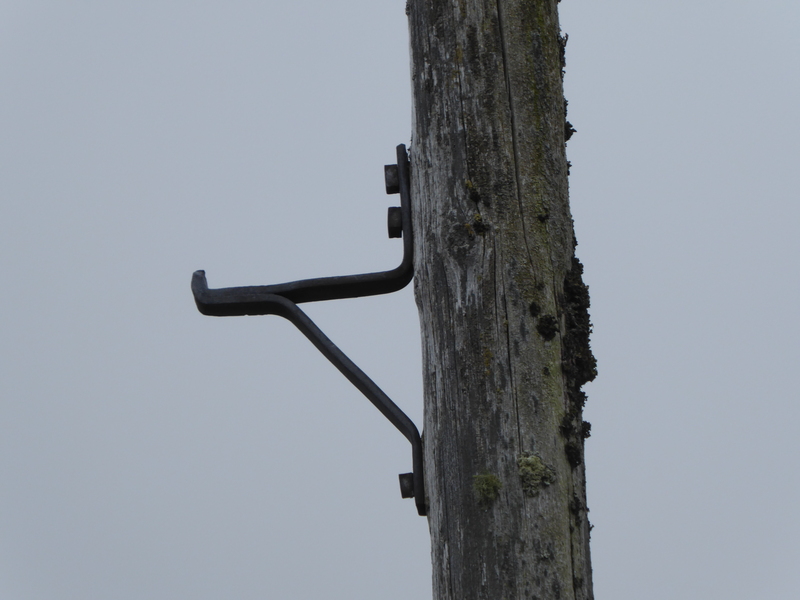 Only one had a timber cross-piece with ceramic insulators near the top, all however had the notch for the cross-piece. First port of call for information was the estate keeper; he was able to tell us that the line of poles had been constructed for a field telephone system from Scatwell over to Cabaan Lodge, which is now submerged under the Orrin Reservoir. 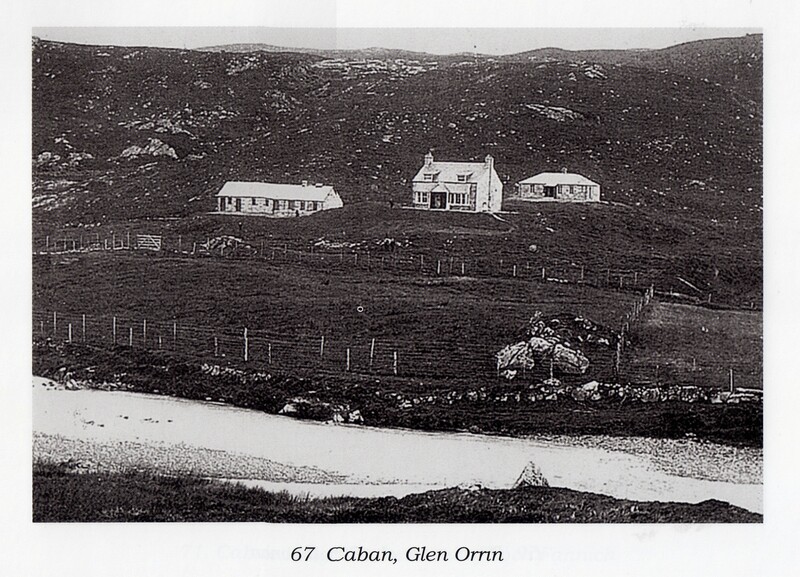 The Orrin Dam was constructed in 1959 as part of the Conon valley hydro-scheme. The keeper also told us that the poles continued for a further 2kms from Loch Aradaidh to a point GR NH 364499 where they disappear into the reservoir. When Sir William Coats Cross (1876 – 1947), a Glaswegian industrialist, purchased the Scatwell Estate in 1919 it included part of Glen Orrin; in the 1920s he established the telephone system to facilitate communication between Scatwell House and Cabaan Lodge, thus negating the need for the two keepers to climb to suitable vantage points and signal the information that a shooting party was planning a visit to Cabaan. Another local resident who had been born and brought up in Scatwell informed us that her father, as a boy, remembered the telephone line in the 1920s; it was a “wind-up” affair. 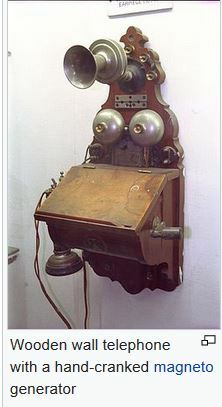 Wikipedia has an image of a “hand-cranked” phone, and provides us with the information that; “rural and other telephones that were not on common battery exchange had a magneto hand cranked generator to produce a high-voltage alternating signal to ring the bell of other telephones on the line and to alert the operator” – it may be that our field system was similar to this? 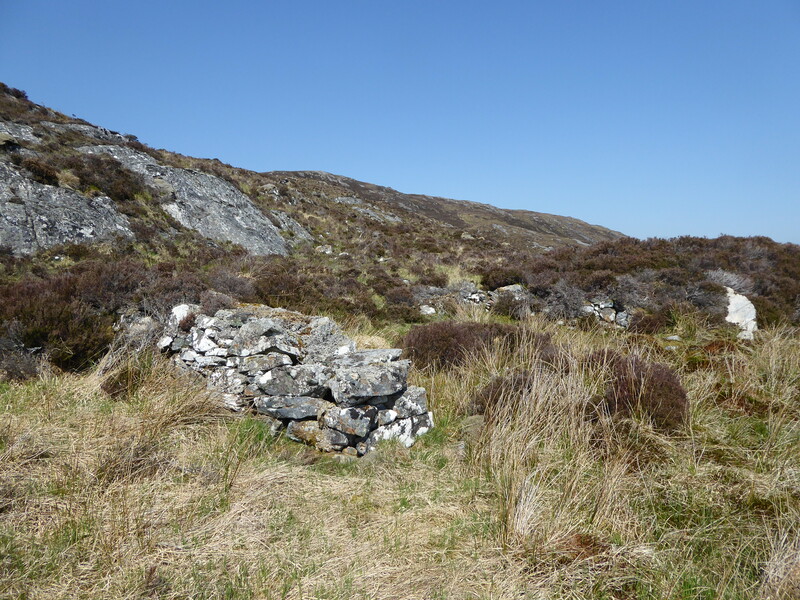 Our day continued very successfully with an ascent of a summit with the curious name of Carn na Cloiche Moire, “Cairn of Mary’s Bell”, and the discovery, on the descent, of yet another illicit still bothy!! 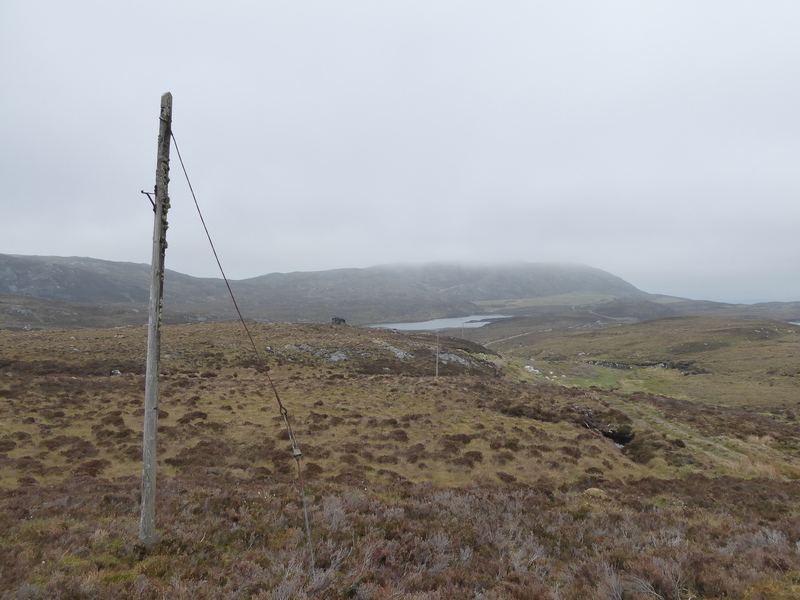 This entry was posted in 20th Century, Strathconon and Ross-shire and tagged Cabaan Lodge, illicit still, Loch an Fheoir, Loch Aradaidh, Meryl Marshall, Orrin dam, Scatwell, Scatwell Estate, Sir William Coats Cross, still bothy, telephone line, telephone poles on September 26, 2018 by nosas.